Day 370- PLATE REMOVAL SURGERY DATE! Luckily it does not clash with my spinning instructor course on the 21st and 22nd of July! Phew! Is it really sad that i would like to keep them after they take them out? Haha! Day 365- ONE YEAR POST OP!!! WOW!! Its been a whole year already! How time really does fly! I really have got used to my new bite now.....but sometimes through habit i still find myself using a knife and fork for foods such as pizza and wraps! Ill remember.....eventually! Haha! I have a few areas that are still numb, in the roof of my mouth and gums and sometimes when i just brush my fingers over my chin i feel a nerve i think haha! 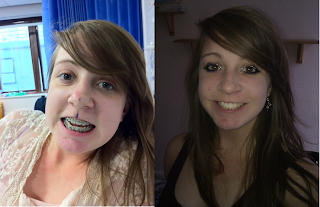 I'm so glad i done it, and had a fantastic orthodontist, surgeon and team of nurses and receptionists at the clinic, that always helped when i had a question or was worried about something. Good luck to anyone waiting for surgery as well as those who are recovering! Its worth it in the end. I phoned up the clinic today to inquire about when i'm having the plate and screws removed from my top right upper jaw as i had not heard anything since April. It turns out i am on the waiting list, however due to a virus outbreak the process has been delayed slightly. Its just a waiting game now. On Friday and Saturday my face really ached, slightly more than usual and on two consecutive days, so i just hope it doesn't become more frequent.